NYC, 02/27/2019, 11:15AM. 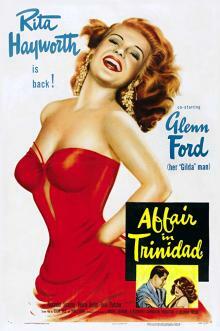 Affair in Trinidad (1952): A crime film-noir starring Rita Hayworth. Starring Rita Hayworth, Glenn Ford, Alexander Scourby. Affair in Trinidad has an Academy Award nomination for Best Costume Design. The movie is notable as Hayworth's "comeback" film after four years away from Columbia.